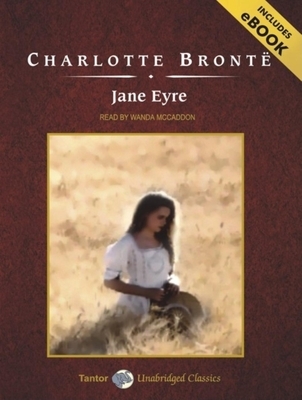 Jane Eyre [With eBook] (Compact Disc) | Let's Play Books! This classic story shows how a young woman can overcome adversity and find true happiness. It is a story of passionate love, travail, and final triumph. Orphaned at an early age, Jane Eyre leads a lonely life until she finds work as a governess at Thornfield Hall, where she meets the mysterious Mr. Rochester and sees a ghostly woman who roams the halls by night. The relationship between the heroine and Mr. Rochester is only one episode, albeit the most important, in a detailed fictional autobiography in which the author transmuted her own experience into high art. In this work, the plucky heroine is outwardly of plain appearance but possesses an indomitable spirit, a sharp wit, and great courage. She is forced to battle against the exigencies of a cruel guardian, a harsh employer, and the rigid social order that circumscribes her life and position. Charlotte Bronte (1816-1855) was an acclaimed English novelist and poet. She is best know for her masterpiece "Jane Eyre," but she is also the author of "Shirley" and "The Professor."